I like to carve pumpkins for Halloween—so much so, that when my kids were younger, I’d let all three of them carve their own pumpkins and then I’d buy an extra one for myself so that I could carve my own. That’s four pumpkins-worth of slimy, stringy, orange-y goop getting flung around my kitchen. I’ve always thought that if you’re going to make a mess, you might as well go all the way. But that’s nothing. One of my team members here at Pear Tree has a neighbor who throws a pumpkin carving party every year for the whole neighborhood. They clean out their heated garage, put up some orange lights and Halloween decorations, and line the floor with a plastic tarp. (Wish I’d thought of that.) They provide the kid-friendly carving tools, but it’s BYOP—Bring Your Own Pumpkin. What a fun, let’s-get-messy party that must be—and how grateful the guests must be that it’s in somebody else’s house! As if that’s not enough, these generous neighbors serve chili, hot cider, and snacks for those who aren’t carving or need a break. Then, before everyone goes home, they put candles in all the pumpkins and turn out the lights in the garage to admire their spooky creations. Ooooooo! It’s not hard to throw a pumpkin carving party of your own, as long as you have the space and don’t mind the clean-up. (Just think. If you roasted all the pumpkin seeds you’d have enough to last a year!) You can make it a potluck if you don’t feel like cooking, or keep it simple with snacks and beverages. 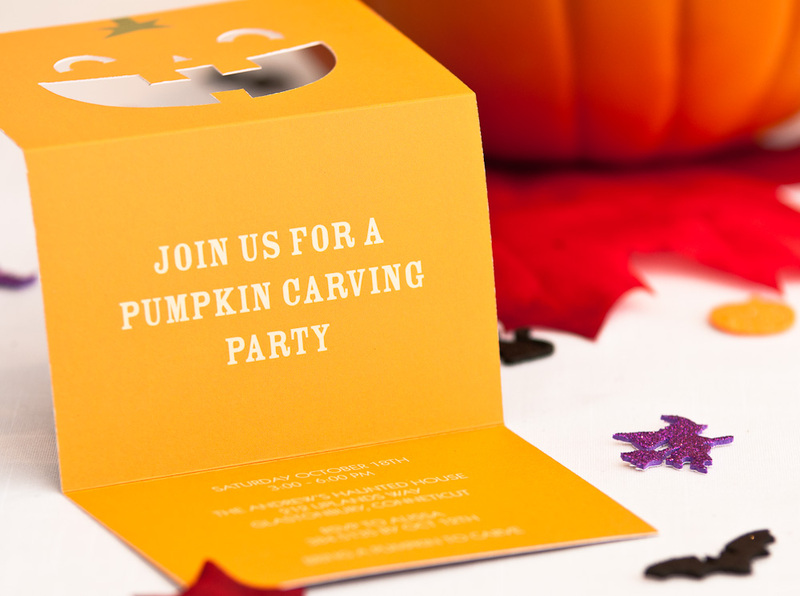 Check out our pumpkin-themed Halloween invitations to get your party started, complete with matching Halloween address labels. And if you have any fun pumpkin carving party ideas of your own to share, we’d love to hear them! Keep reading our blog for more Halloween party ideas. What a fabulous idea! I like the idea of a getting messy party because it’s so casual and fun. Everyone will leave something great- a custom pumpkin design! Thanks for the references for invites and return address labels. Sure to be a spooky success!